In the wake of the recent announcement on the fate of the CN Newcastle subdivision, many are asking what would become of the VIA Rail Ocean if the Miramichi-Bathurst section was abandoned. Well, there are three choices, one of which is highly unlikely. It's possible that VIA could choose the route of the former Atlantic, running from Halifax and Moncton to Saint John and then through Maine to Sherbrooke and on to Montreal. This is highly unlikely for several reasons, including the customs clearing issues, traveling over two different shortlines (NB Southern and whatever Fortress appoints to run the former MMA), and the fact that I don't think through traffic through Lac-Mégantic has even resumed yet. I believe we can safely dismiss this option. 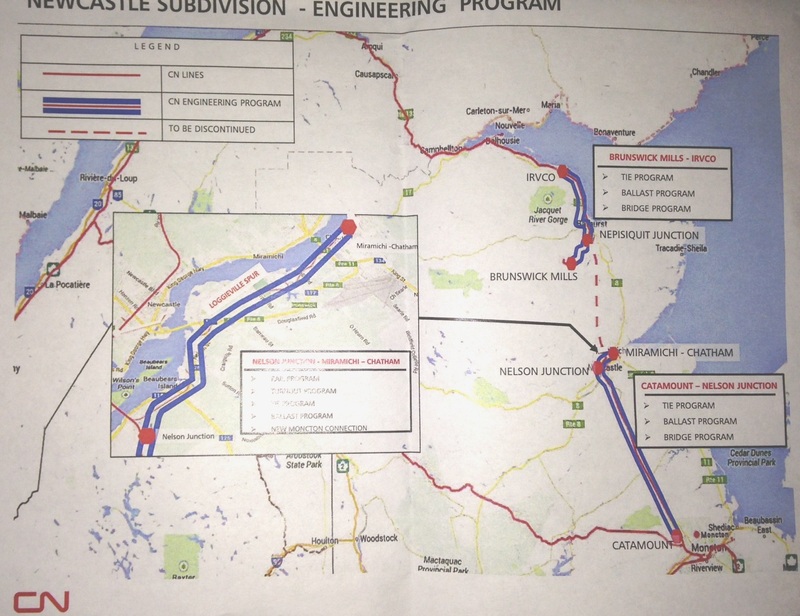 The most obvious choice is to run through central New Brunswick over the CN Napadogan subdivision and into Quebec over the CN Pelletier subdivision, rejoining the current Ocean route at St. Andre Junction. This is CN's main line through the Maritimes and is well maintained... despite a couple of recent derailments. Here's a map I drew showing that route. Click on the map for an interactive version. The Ocean has detoured on this route before. Back in 1977 the Ocean was routed here for about six months due to a landslide on the northern route - the amended schedule is shown to the right. In better days a decade earlier, there was an RDC (Rail Diesel Car) that ran between Moncton and Edmundston. 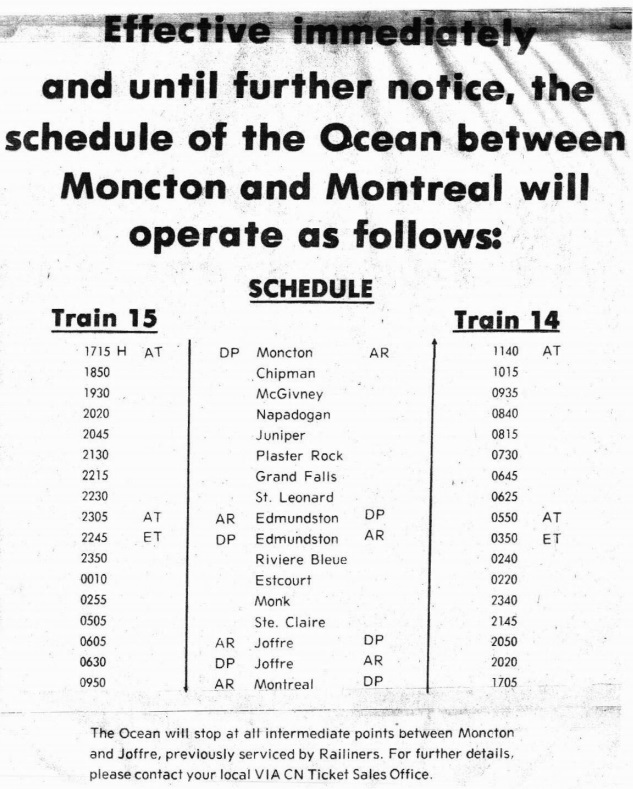 Heck, for a short time in the summer of 1967, the Cabot ran between Montreal and Sydney via Edmundston, and from October 29, 1967 to January 7, 1970 the Ocean ran via Edmundston while the Scotian continued on the northern route. This route would be similar today but since the Pelletier cutoff was built, the train would not go through Monk and Ste. Claire. There are a few downsides to having the Ocean run over the Napadogan. Northern New Brunswick and northern Quebec would lose their passenger service. There is an alternative, Maritime Bus in NB and Orléans Express in Quebec, although I think you'd find most people would rather take the train. There are fewer available passengers over the Napadogan route, given that the Napadogan runs through virtual wilderness between Moncton and Edmundston. This would be a gain for Edmundston, Grand Falls and a few other communities, but fewer passengers = less revenue = more chance of outright cancellation. A capital investment would be required for VIA to provide station facilities, as nothing really exists since passenger service ceased in this area. One upside might be that Fredericton could get indirect passenger service via a connection at McGivney.. maybe. The most serious possibility is that VIA Rail will simply stop running the Ocean altogether. The chilling headline Via Rail's Maritime-Quebec passenger service in doubt says it all. As for purchasing the section of track between Bathurst and Miramichi, Bélanger said, "Via Rail does not have the financial resources to acquire or maintain this section of the tracks. So we'll wait for any developments." But What About The Gaspé? One more thing - don't forget that the train serving the Gaspé peninsula (the former Chaleur) ran as part of the Ocean between Montreal and Matapedia. If the Ocean was to run a different route, or be cancelled altogether, the economics of the Gaspé train would be even worse as it would have to bear the entire cost of the Montreal-Matapedia section. You may recall that the Gaspé train has not been running for quite some time, due to track problems. These track problems have been solved between Matapedia and New Carlisle, yet VIA has not committed to returning to the route. The future of passenger rail east of Montreal is more and more in doubt. EDIT: Thanks to Tom Box for a few corrections. The CBC is reporting that the New Brunswick government has agreed to give CN up to $25 million to upgrade and maintain most of its rail infrastructure in northern New Brunswick, with a matching investment by CN. This is a most puzzling announcement. You may recall that in August 2012 CN applied to abandon the section of track from Catamount (the junction with the CN Napadogan subdivision) to Irvco (in Belledune), citing poor economics. This would have resulted in no rail service to Bathurst, Miramichi and Rogersville. CN would have retained the section from Irvco through Campbellton and into Quebec. Today's announcement shortens the amount of track to be abandoned, but does not eliminate it. The entire Campbellton to Catamount track is to be upgraded and retained, with the exception of the section from Nepisiguit Junction to Nelson Junction just south of Miramichi which is to be offered for sale in February. CN's own maps show it best. These photos were taken by Marc Genuist of CBC and kindly sent to me. The double blue line areas are to be retained and upgraded. Both the southern and northern portions will have ties and ballast replaced and bridges remediated as required. 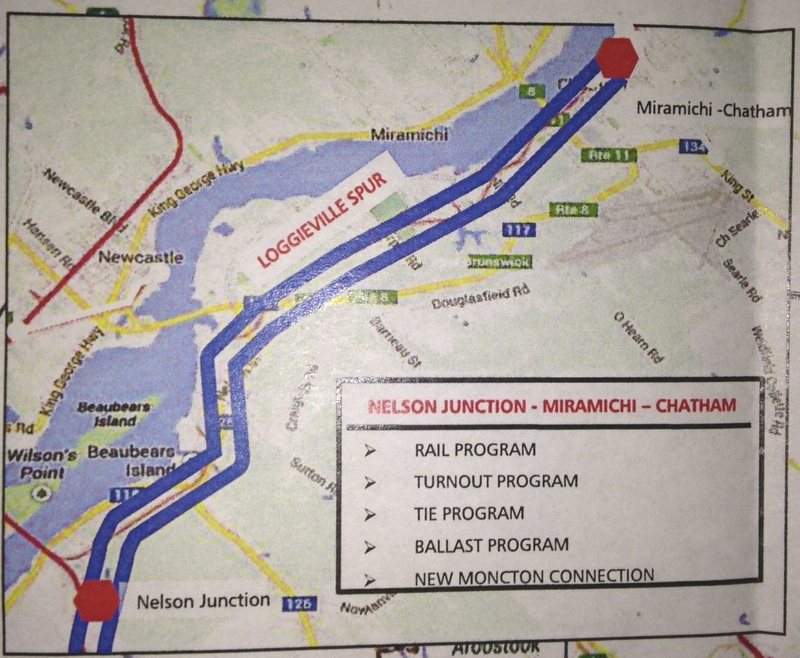 The Loggieville spur (shown in the inset and below) will also have turnouts remediated and will have a "new Moncton connection". I'm told this is an east leg to make a wye at Nelson Junction so trains to/from Moncton don't have to cross the Miramichi, as they currently do. VIA Rail's Ocean will not be able to run through northern New Brunswick any more. Understandably, local mayors and residents are very upset. The agreement also means that existing shippers will continue to have rail service. To my knowledge, these are the major shippers on the northern portion of the line and their locations. Note that not all of them may be active rail shippers at this time. What this also means is that traffic from northern New Brunswick will have to go all the way across Quebec before it rejoins the CN main line at Rivière-du-Loup. 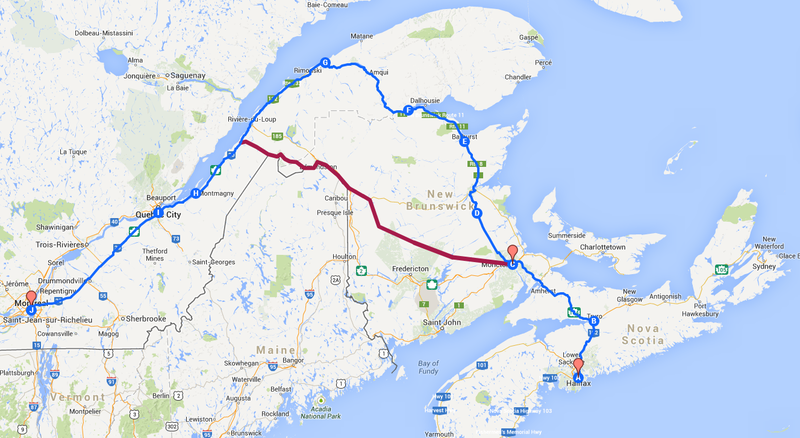 Effectively northern New Brunswick would be at the end of a long, long spur. This does not bode well for the future of rail freight in New Brunswick. There are no shippers between Nepisiguit Junction and Miramichi, nor have there been for quite some time. On the southern portion of the line, these are the only two major shippers that I am aware of. CN lifted the Miramichi port spur last year, which removed Miramichi Lumber Products as a potential shipper. The province's press release says that "CN, the province and local businesses will continue to work together to increase freight traffic in future years, with benefits to be shared between the two partners". I don't know what the terms of the sharing would be. Would CN repay some of the investment? The federal government was very noticeable in their absence from the announcement. The auction has been held for the Montreal, Maine and Atlantic (MMA) railroad and the winner was the "stalking horse" bidder, Fortress Investment Group of New York. The Eastern Maine Railway and the Springfield Terminal Railway Company made a bid for the Maine portion of the MMA but the trustee wanted to sell the entire railroad to one bidder, so Fortress won. There is some speculation that there were other bids but since the auction was "closed door", it may never be made public. The Eastern Maine Railway, along with sister companies NB Southern Railway and the Maine Northern Railway, are owned by J.D. Irving. The Springfield Terminal Railway Company is a subsidiary of the Pan Am Railway, formerly known as the Guilford Rail System. Fortress owns the Florida East Coast Railway and used to own RailAmerica before selling it. The editor of the Atlantic Northeast Rails and Ports newsletter was nearby and reported that John Giles was Fortress' representative at the auction and that the auction apparently took about 40 minutes. Mr. Giles is a veteran railroader and presumably will helm the MMA. The deal still has to be confirmed in both Canada and the USA. This is supposed to take place on Thursday in both countries. Earlier this week, CN 308 derailed just outside Plaster Rock, New Brunswick on Tuesday January 7. A number of the tank cars on the train caught fire and burned, quite spectacularly, but fortunately no one was hurt. The CN Napadogan subdivision was blocked until early Saturday morning. During that time, CN detoured trains through northern New Brunswick over the ailing Newcastle subdivision. CN 308 had three locomotives on the head end, one DPU engine near the rear (CN 2684), and 122 cars. 19 cars and the remote locomotive derailed. Two of the LPG (liquefied petroleum gas) cars burned, and officials conducted a controlled burn to put the fire out. Preliminary reports indicate that a car near the head end (13th car?) had a broken wheel. 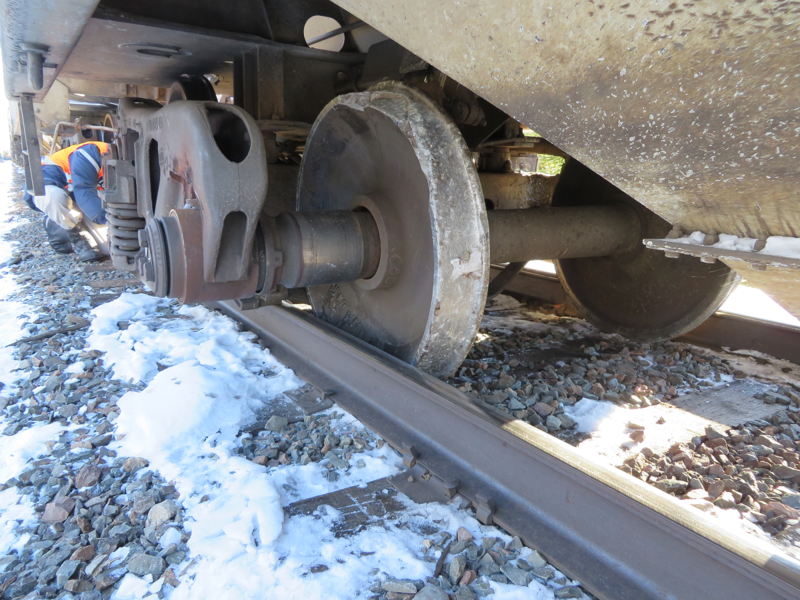 The initial Transportation Safety Board (TSB) findings indicate that the broken wheel tore up the track and rails for 10 miles before the derailment, and they found 17 broken rails and 50 impact locations on the rails. About 150 people in the area were evacuated as a precaution. They are now permitted back in their homes but have been instructed not to drink local water, as it may have become contaminated. Here's a TSB photo of the offending car. Notice how both wheels are sitting on the ground between the rails. 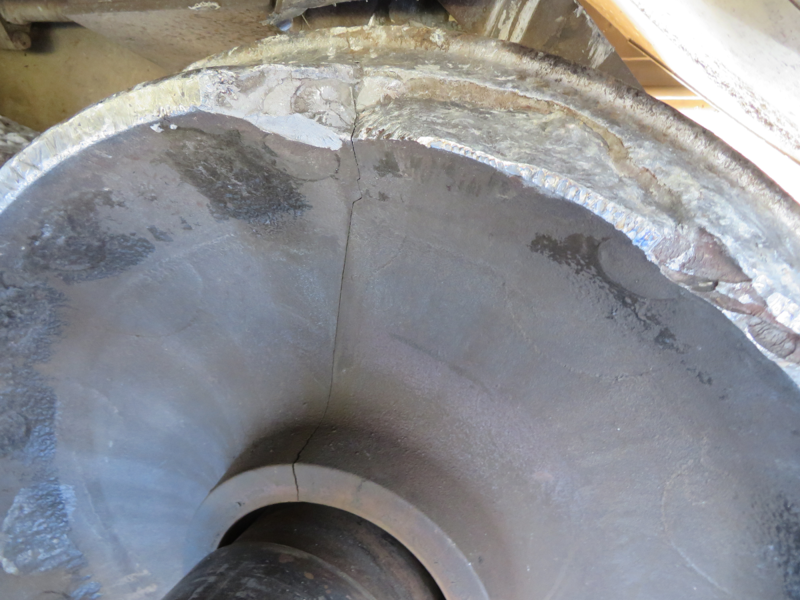 There's a closeup of the wheel showing a big crack in it. I wonder if they will be able to determine if the crack was there prior to the derailment, or whether it was caused by banging on ties and crossings and so forth for 10 miles. The challenge with detouring on the north line is that there are few places to meet, given the short and infrequent sidings. CN 120 and 121 met in Campbellton and there was another meet at Irvco near Belledune. Photos courtesy of the TSB's excellent Flickr page. Thanks to all of the railfans (Wendell, Nicolas, Michel and more) for their sightings. UPDATE: The cleanup is nearly complete as of January 22. UPDATE: The wreck site is now open to the public, as of February 10. I was going to write about the CN derailment near Plaster Rock and the subsequent detours, but sadly there is something more important to talk about. Railway historian, author and activist Jay Underwood passed away yesterday evening (January 8). Jay was ill for quite some time but it was still unexpected to most railfans. This is a huge loss to his family and to the Nova Scotia railway community. Jay was quite active on the railway mailing lists, despite his near blindness from a sudden illness about 15 years ago. You could always count on him for an accurate answer to many Nova Scotia railway questions, and he was generous in sharing his knowledge through email and also through his many books. In fact he founded his own publishing house, Pennydreadful Publishing, to publish books that traditional publishers wouldn't take. I consider his book Built For War one of the best historical railway books I have. Jay was the president and most active member of the Nova Scotia Railway Heritage Society. He cared passionately about Nova Scotia's history and heritage and campaigned for a number of causes, including attempting to save Kentville's roundhouse and Elmsdale's station. I met Jay at least once, at a train show in Dartmouth when he was manning the NSRHS booth. He seemed like a very nice man in person, and he certainly came across that way in email.